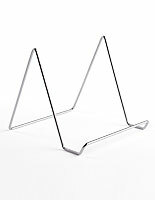 Looking for an affordable artwork display that will last for years of use? 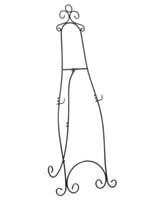 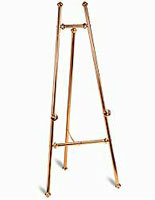 Our metal floor easels are made with quality materials and craftsmanship to last for a very long time. 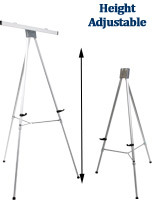 These economical artist stands are often used to exhibit paintings, posters, announcements, and even menus. 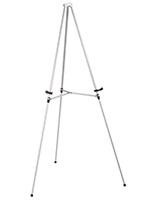 All of these sturdy metal floor easels feature a simple yet modernized design that complements any graphic and environment. 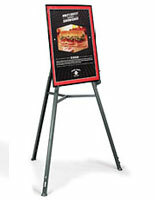 Sleek freestanding displays are ideal for businesses looking to update their advertising showcase. 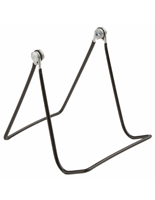 Each durable metal floor easel is offered with bulk pricing to easily supply chains of restaurants and stores. 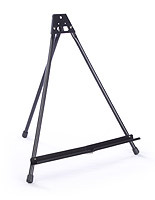 Studio tripods also benefit from their compact design that folds down for easy transport. 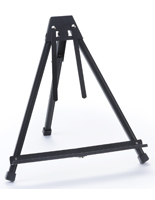 Shop our portable freestanding image holders for the right model for your needs. 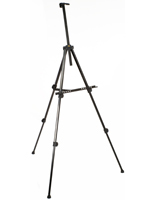 What features are available with these sturdy tripods? 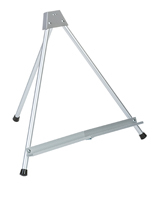 Metal floor easels, while made of durable steel and aluminum, feature a portable collapsible design. 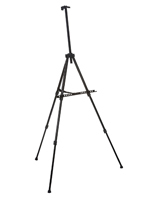 Some models take it a step further with telescoping legs that makes them easier to bring on the road. 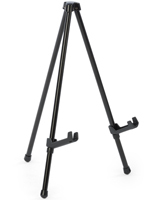 These tripods with retractable supports are perfect for bringing to events because they can shrink to a fraction of their full size. 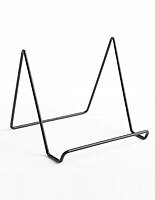 We also stock a nice variety of tabletop models, which are terrific tools for showcasing merchandise for retail or trade show applications. 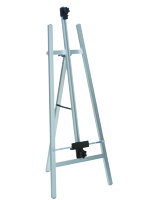 We offer floor easels to accommodate most frames and printed graphic boards. 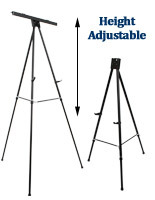 Some of these portable image stands have adjustable pegs for holding different sizes of media. 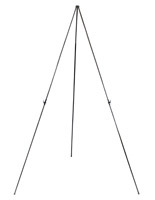 This is great for wedding venues and convention halls, making it easy to fit any party's graphics. 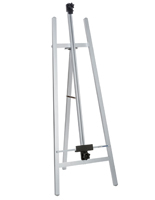 Our aluminum and steel floor easels include models that are shipped fully assembled. 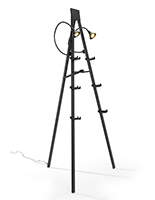 This is excellent for businesses and artists that are in a rush to display their work. 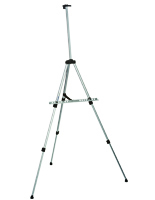 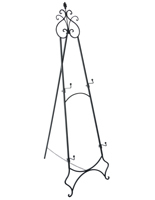 Tripods that require assembly take only minutes to put together and don't need any additional tools. 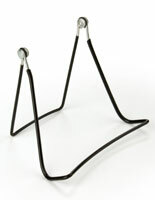 However, when it comes to bulk orders and rush jobs, pre-assembled displays are the most convenient choice. 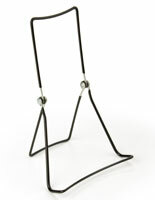 Our catalog of painting stands is available in a wide variety of finishes to match their surroundings. 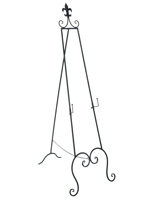 Colors include black, silver, and classic brass/gold. 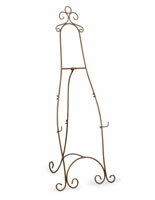 Looking for something with more style for settings like art galleries or museums? 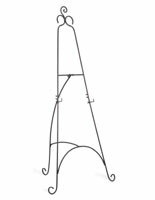 Try decorative easels that feature fleur-de-lis designs. 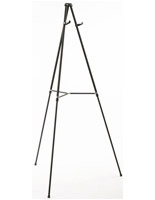 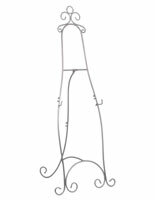 Ornate artwork stands are great for showcasing artwork or navigational directories. 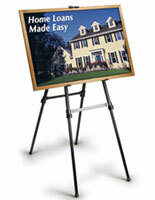 Place guides in office or hotel lobbies for visitors to be able to navigate more easily. 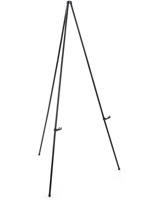 These affordable image fixtures are commonly used in restaurants, storefronts, museums, and even schools. 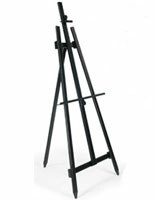 While easels are often used by artists or art galleries to complement a painting, their design is highly versatile. 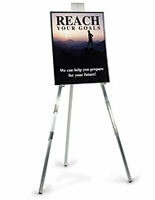 Promote events like weddings and conferences with their stylish and attention grabbing design. 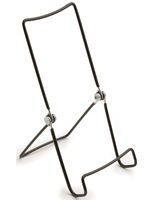 We have a huge selection of quick change snap open frames that make it easy to swap graphics. 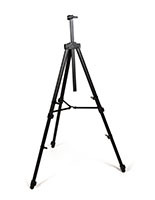 This is great for informing guests at hotels, event venues, and dining halls about goings-on. 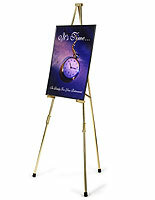 Put your work or special occasion in the spotlight with these unique sign holders.